NOTE: The “potlatch” is a ceremonial gathering for spiritual healing and removal of grief for the loss of an honored clan member. It begins with gathering traditional foods and creating regalia (Chilkat robes, button blankets, headdresses, masks, and other adornments) for the potlatch. The potlatch is known for Tlingit oratory with speeches, songs, and storytelling. This video is Tlingit/Tsimshian poet, Donna Beaver’s Tlingit oratory through haiku and other short poems honoring artist, friend, and Chilkat weaver, Clarissa Rizal who joined our Alaska Native ancestors in December 2016. 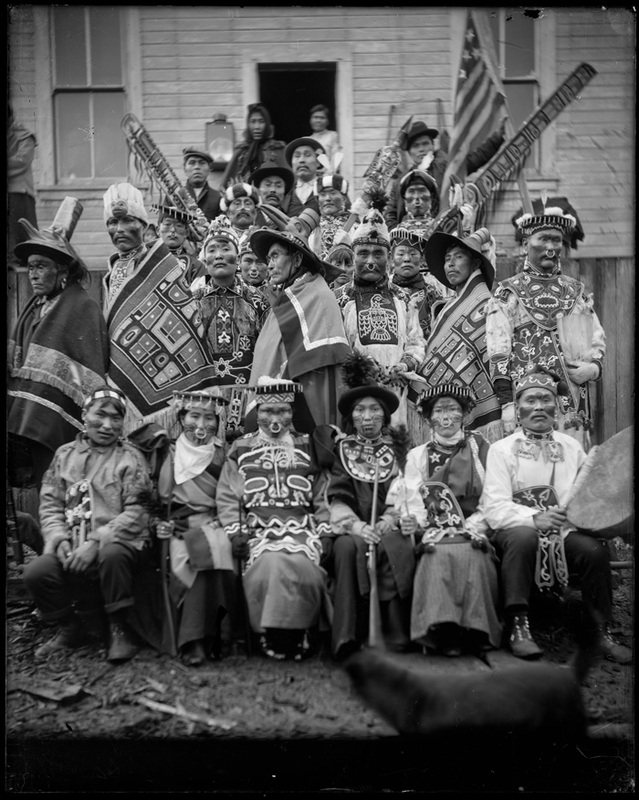 The Tlingit Potlatch of 1904 in Sitka Alaska -- from the E.W. Merrill Photograph Collection at Sitka National Historical Park, National Park Service.